Mazda CX-9 employs game-changing innovation towards jaw-dropping fuel-economy. With the real-world clearly in focus, Mazda continues to invest heavily in technology to evolve our dependence on fossil fuels and, while remaining environmentally responsible, create vehicles that keep the joy of driving… joyful – all the way to the fuel pumps and back. With the real-world clearly in focus, Mazda continues to invest heavily in technology to evolve our dependence on fossil fuels and, while remaining environmentally responsible, create vehicles that keep the joy of driving… joyful – all the way to the fuel pumps and back. 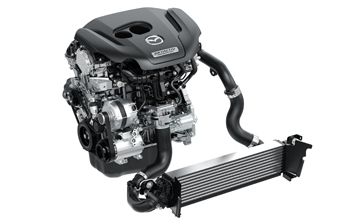 Our revolutionary SKYACTIV Technology is total-car engineering strategy delivering superior fuel economy, enhanced safety, lower emissions and a natural, intuitive response to driver input – with no loss of Mazda’s signature driving exhilaration. Mazda’s 2016 CX‑9 is proof of the fact that you can have it both ways with its 35% improvement in fuel efficiency. Yet, the fact that the CX‑9 is a midsize, three-row crossover makes it exceptional news indeed – as it has accomplished this milestone without having to use an extra-cost hybrid or diesel powertrain. Despite the further enhancement of its interior with elegant appointments and generous trim levels, the car weighs 150 kg less. Its SKYTACTIV‑G 2.5T engine uses its dual-valve Dynamic Pressure Turbo design to deliver the power of a V-6 without the added penalty of losing out on fuel-efficiency. Certified by Natural Resources Canada, the CX-9 boasts an impressive 10.5 City/8.3 Highway/9.5 Combined results (L/100 km) when equipped with Front-wheel drive. Delivering 310 lb-ft at 2,000 rpm and 227 HP at 5,000 RPM, the 2016 CX‑9 is not at any loss for performance ability. Paired with a 6-speed SKYACTIV‑Drive auto transmission, this combination offers extreme confidence no matter the road condition while the option for i‑ACTIV All‑wheel drive adds further sure-footedness, no matter the weather, delivering efficiencies of 11.2/City/8.8 Highway/10.1 Combined. The 2016 CX‑9 has been designed with you and your family in mind and you can rest assured that – regardless of fluctuations in world oil prices ­ – there’s no better choice in a fuel-efficient, mid-sized SUV that blends equal parts fun to exhilarating ride while addressing family responsibilities and specific family needs. You can’t really experience the many advantages of the new CX‑9 until you get behind the wheel of one. Discover for yourself why it’s been so well-received by the critics. *The all-new 2016 CX-9 achieves best-in-class front-wheel drive and all-wheel drive for city, highway, and combined fuel economy ratings as compared to 2016 model year non-hybrid, 3 row-SUVs within the intermediate SUV segmentation in Canada. Fuel consumption values were determined using approved test methods based on EnerGuide fuel consumption ratings published by Natural Resources Canada. Your actual fuel consumption may vary depending on how, where and when you drive. For comparison purposes only. Estimated fuel economy based on Government of Canada's approved 5-cycle testing method. For more information on 5-cycle testing, visit mazda.ca/5cycle.